Why You Need To Get Your Commercial Pilot Training, Get The Answers To That And More! Don't go for your Commercial Pilot Training until you have at least 250 hours of Pilot in Command time built up. If you are a new pilot just starting out, getting your Training can be a very expensive endeavor. Just take that 250 hour amount and multiply it times renting a plane and you will have an idea how expensive this rating can be. But if you already have the flight time built up, then by all means it is worth getting. If you are a new pilot, I recommend you find a cheap flying club or buy yourself an inexpensive experimental plane. Then just have a ball flying all over the place and enjoy the true wonders and beauty of it all. Then before you know it you will have accumulated the necessary time needed. And can now go after the Commercial Pilots License. Until then, just relax and enjoy everything flying has to offer. In the following paragraphs below we will explore exactly what it takes to become a Commercial Pilot. And explore all the limitless possibilities once you do. Now we will take a closer look at what all is required of you to get your License.</b> See below what is required to start your Commercial Pilots Training. •You have to be able to read, speak, write, and understand the English Language. •You must be able to obtain a 2nd class Medical Certificate. •You must be at least 18 years of age. •You must hold at least a Private Pilots License. •You must have received and logged the appropriate ground and flight training for the commercial Pilot Training. •You must have 250 hours of total flight time. •You must have 100 hours of Pilot in command flight time. •You must have 50 hours of Cross Country flight time as pilot in command. •You must pass the FAA Commercial pilot written exam. •You must pass the Commercial Pilot Oral And Practical Exam. After all your Commercial Flight Training you are now ready to go take your check ride with an FAA Examiner who will put your newly acquired skills to the test. You will be required to take your check ride in a Complex Airplane. This is a plane with retractable landing gear, and a variable speed prop.It usually takes about 10 hours to get checked out in one, mostly do to insurance requirements. The FAA written exam for the Commercial Pilot License is very similar to the one an individual would have to take for his or her Private Pilot License. There are 80 questions covering topics like Commercial operations, Complex aircraft systems, performance calculations and aerodynamics. Once you have passed this written it is good for a period of 24 months after you have taken it and passed. When taking your Commercial Pilot Training FAA Oral Exam this usually consists of several topics like commercial operations & limitations, weather, cross country planning and much more. Your examiner will more than likely have you plan out a mock cross country flight and then discuss your flight planning and evaluate your thought process and level of knowledge on the subject. Once the examiner is satisfied that you know everything that is required. You will then be ready for the flight portion of the exam. The Commercial Pilot Training FAA practical Exam is your final test to complete before receiving your Commercial Pilot License. This will be a demonstration of your ability to fly to the standards of a commercial pilot. The standards are tighter but by the time you reach the required flight time the demands being placed upon you are not excessive. During the flight you will have to demonstrate all the typical flight maneuvers such as. Stalls,Steep Turns,Slow Flight along with Chandelles, which are steep climbing turns with a 180 degree change in direction. Lazy 8's and 8's on pylon's. You will also have to demonstrate to the Commercial Flight Training examiner Emergency procedures such as Simulated Engine Failure, Landing gear failure or possible loss of instruments. And you will be required to demonstrate Takeoff & Landing on Short and Soft Field operation along with no flaps landings. After successfully completing all your Commercial Pilot License requirements you will then be issued a temporary Commercial Endorsement. At this point you can legally charge a fee and start earning money doing what you love the most, "flying". 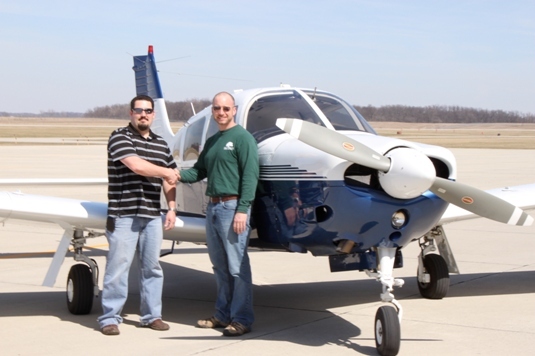 A short time later you will receive your new Pilots License with Your Commercial endorsement on it. Give yourself a big pat on the back for a job well done completing your Commercial Pilot Training!! Thanks for flying in to see whats new, this page is still under Construction, But feel free to Bookmark this page and fly-by from time to time and see whats new. As always, stay safe and Happy Flying! !